The Goodwood Revival is a truly unique event held at Goodwood Motor Circuit each September, with the sole aim to relive the circuits glory days of the 1940-60’s. It features 15 races held over the course of the weekend, with each race ‘in the spirit’ of a certain period of a historic race or car-type. Guests at the Revival dress in a similar manner to the periods celebrated and the Goodwood Revival hospitality facilities are decorated in breathtaking fashion. This years Revival features a bumper line-up, with the races extending later into the evening than ever before. Friday is all about the race practices, which are taken in Race Order. From 9am to 5.35pm there’ll be a magnificent range of vehicles, two-wheeled and four charging their way through the laps. At 6.15pm the Freddie March Memorial Trophy will be held in the spirit of the famous Goodwood Nine Hour races from 1952-55, marking 60 years since the first race of it’s kind. Expect to see classic sports-racing cars such as the Aston Martin DB3 and Ferrari 750 lit up by the twilight during this 90-minute two-driver race. Goodwood will be woken Saturday morning by the thunderous Grand Prix and Voiturette cars of the 1930-50’s, desinged pre-WW2, racing in the Goodwood Trophy at 10.00am which will then be followed by the Fordwater Trophy at 10.40am containing production and GT cars from the 1960’s. Expect Le Mans style drama in the Barry Sheene Memorial Cup (Part I) at 12.25, as riders take to their stunning 1950’s motorcycles in the two-rider, two-part race. The highlight of the Friday has to be the Shelby Cup at 14.55 however, which this year will feature a grid exclusively made up of AC Cobras from the 1960’s, in celebration of the model’s 50th anniversary. Sunday will again contain the Barry Sheene Memorial Trophy and St Mary’s Trophy with Part II being played at on both at 11.45am and 12.50pm respectively. The highlight of the Revival is undoubtedly the RAC TT Celebration race, featuring closed-cockpit GT cars in the spirit of the same RAC TT races from the 1960 – 1964. Past and present greats will drive a grid of super-rare GT cars, such as the Ferrari 250 GTO, which together value at over £100 million! Finally the Sussex Trophy brings the Revival to a close at 16.45 with a grid containing the powerful World Championship cars from the mid to late 50’s. Expect to see heavyweight names such as Aston Martin, Maserati, Ferrari and Jaguar on the grid. Also you’ll be able to see Silver Arrows grand prix cars return to Goodwood for the first time since the 1930’s. For vintage racing fans this is a true once in a lifetime experience; you’ll be able to witness these priceless pieces of motor racing history in an amazing demonstration, driven by world famous drivers. The demonstration will be on Friday, Saturday and Sunday so it’s not to be missed! 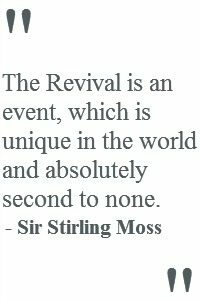 And as always you can expect live music and entertainment throughout Revival weekend. There’ll even be a street party `Over The Road’ opposite the motor circuit each evening for revelers to twist and shake till 10.30pm.